Former U.S. Secretary of State Condoleezza Rice said Thursday that she will write a memoir about her eight years in the White House. (CNN) - Former U.S. Secretary of State Condoleezza Rice said Thursday that she will write a memoir about her eight years in the White House, but only after her family memoir "Extraordinary, Ordinary People" is released. The first book, which recalls much of the Rice family's time during the Civil Rights era in Birmingham, will be published by Crown and is scheduled to go on sale October 12. Rice spoke at an author panel during the 10th annual Book Expo America, a gathering of publishing and book retailers held at New York's Javits Center. Also on hand was moderator and Daily Show host Jon Stewart, who sheepishly admitted as he introduced Rice: "I am not particularly familiar with her work–but I hear good things." 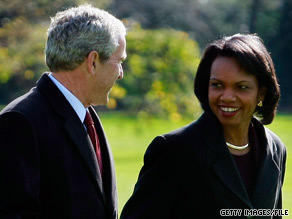 After thanking Stewart for his 'stirring introduction,' Rice said she felt could not yet write a White House memoir until people understood the "personal and implausible journey" she had taken from being born in 1950s segregated Alabama to being named the first female African-American to lead the State Department. All of this happened, Rice said, due to her parents, John and Angelena Rice. A guidance counselor/preacher and school teacher respectively, Mr. And Mrs. Rice never made more than $60,000 annually, Rice said. Yet they "believed in the transformative power of education and the armor of control it can put around you," she said. Despite being raised in a city resistant to quality education for blacks, Rice's parents used their meager resources to provide their only child with piano lessons at 3. She also took French and ballet. She never learned to swim as a child because Birmingham Public Safety official Eugene "Bull" Connors forbade blacks and whites from sharing public swimming pools. Regardless, Rice's parents refused to let the racial tensions limit her potential. "Even if I could not have a hamburger at a Woolworth's counter, my mom taught me that I could be President of the United States," Rice said. A long-time Republican, despite being mentored in international affairs by the Josef Kobel, the father of Democratic Secretary of State, Madeleine Albright, Rice said her family's introduction into the GOP resulted from a Jim Crow "poll test." The now illegal practice of requiring black voters to answer questions before being permitted to vote, poll tests were 'the teeth of Jim Crow,' Rice said. While her mother answered the name of the first U.S. President, George Washington, correctly and was allowed to vote, her father was asked to identify the number of beans in a jar, she said. Unable to do so, John Rice later learned of a woman poll worker who would allow him to vote if he aligned himself with the GOP. "And that is how my father became a Republican," she said. While they did see Rice to on to graduate from Stanford University, and eventually become a provost there, her parents never lived to see her in the White House. Her mother lost a 15-year-battle with breast cancer in 1985. Her dad died just before George W. Bush was inaugurated. Still she recalls them showing her a photo of an eight-year-old Condoleezza RIce standing outside the White House where she believes it was grandfather who told her at the time: "You may be standing out here now, but you will be working in there someday." Sorry Rice, I don't care about the journey you took, but I am well familiar with the journal you shouldn't have taken. Write about that and maybe I'd buy your book. Until then, glad you're gone along with GWB. "On a lighter note I had found a great deal on some pumps at Guchhi while shopping in New York." Man this book will be taking up all the Space in the Clearance Section at my Barnes and Noble's !!!!! I wonder if she'll reveal how she sleeps at night with the blood of hundreds of thousands of innocent people on her hands? I imagine that to keep someone up at night if they have any semblance of a heart in their chest. Where were you with your Civil Rights Pride flag during the inauguration of the first African-American DULY elected President of this country? You were CONSPICOUSLY missing sellout, err, Condi. For that matter, where were you when your Boy was running us into the ground, or should I NOT ask? Condi 'Alfred E. Newman' Rice I used to be proud of you. I guess I should still be proud. There is nothing wrong with a woman knowing her price, no matter how educated she may be, and selling out to the highest bidder. You people make my day. All I'm waiting for is the wonderful Dominican Mama, she's the best. Too bad she wasn't running for president this time.I like her a lot better than what we ended up with. I guess this administrations memoirs will be titled " How I took America down the tubes" or " The socializing of The U.S.A"
Was there a haters parade and nobody told me? Some of you are just sad little liberal people! As you are bashing Dr. Rice, you are cheering lying (Blementhal), and by his own account, bribery (Sestak). It would appear to me you have your hands full of cleaning your OWN house. By that picture, they look so IN LOVE!!!!! What will the title? The eight years of me, dumb bush and war criminal cheney? Please don't start telling the truth NOW; that would be sacrilegious.